Karlsruhe Christmas Show Germany stop using elephants in your shows. They are suffering. 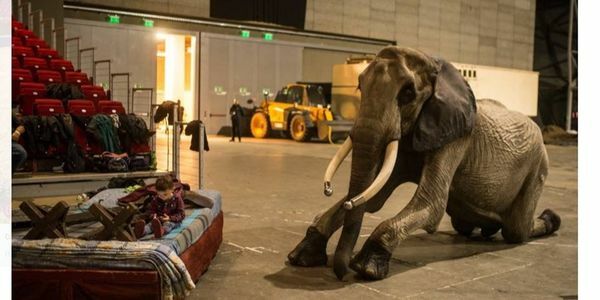 The Karlsruhe Christmas show once again performed with René Cassily Jr's elephants. He was part of the program with his four female elephants Nanda, Tonga, Kimby, Betty and with his one elephant bull Mambo. Again this show will attract many enthusiastic visitors who love the circus. There is nothing wrong with the circus as long as they don't use wild animals, and as long as they treat their domestic animals like horses or dogs in a kind and positive way. But this is not the case. In 2011, undercover images revealed that even during the show in Karlsruhe, Rene Caselley Sr used little hooks to stab or "guide" the elephants on their chin or behind their legs. This year it will be Rene Caselley Jr who will bring the elephants. But as you can see from the picture, the elephants are still not well-cared for. Just look at the picture above of one of the elephants. She looks sick and extremely emaciated, and is lying on a cold floor outdoors in December. Is this what you want to see? Abuse, bad treatment and suffering? Is this what a Christmas Show should be? Just as other countries have done, Germany needs to ban the use of wild elephants in circuses. Let them retire to an elephant sanctuary in France when the facility is ready to welcome them. Stop the abuse, stop the torture. Wild animals don't belong in circuses. As a real "sensation" this year, MERRYLU & JOZSEF RICHTER included in the Karlsruher Christmas circus a big "exotic carousel", meaning that their 32 animals all together will make a performance: elephants, camels, zebras, horses, lamas and two giraffes. PEOPLE WHO HAVE THEIR HEART ON THE RIGHT PLACE REFUSE TO VISIT SUCH CIRCUSES . PLEASE SIGN, SHARE AND EDUCATE TO BAN THE USE OF WILD ANIMALS IN CIRCUSES.